SEOUL, Korea, Republic Of -- A beaming South Korean President Moon Jae-in, freshly returned home Thursday from a whirlwind three-day summit with Kim Jong Un, said the North Korean leader wants the U.S. secretary of state to visit Pyongyang soon for nuclear talks, and also hopes for a quick follow-up to his June summit with President Donald Trump. Only hours after standing with Kim on the peak of a volcano that's at the heart of Kim dynasty propaganda, Moon told reporters in Seoul that he will be carrying a private message from Kim to Trump about the nuclear standoff when he meets the U.S. president in New York next week on the sidelines of the UN General Assembly session. 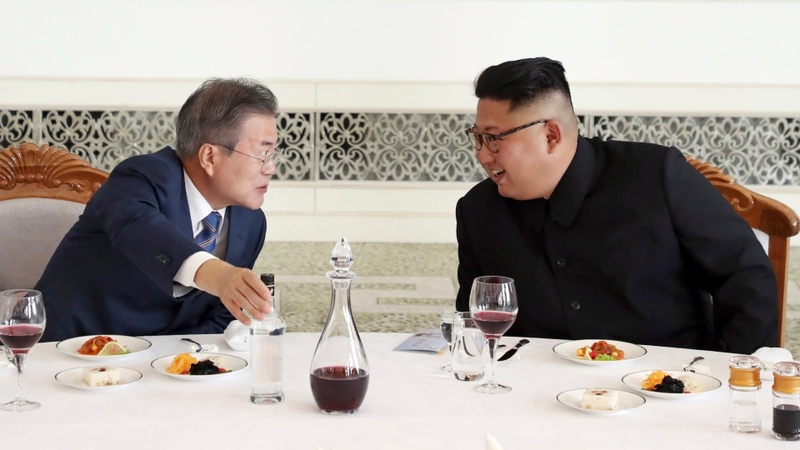 Moon faces increasing pressure from Washington to find a path forward in efforts to get Kim to completely -- and unilaterally -- abandon his nuclear arsenal, which is thought to be closing in on the ability to accurately target any part of the continental United States. "There are things that the United States wants us to convey to North Korea, and on the other side there are also things that North Korea wants us to convey to the United States," Moon said at a press centre in Seoul where reporters had watched parts of his summit with Kim on huge video screens that occasionally showed live streams from Pyongyang. "I will faithfully serve that role when I meet President Trump to facilitate dialogue between North Korea and the United States." Moon, who set up the Singapore summit and is eager for another to happen, also told reporters that he'll convey to Trump his and Kim's desire to get a declaration on ending the Korean War by the end of this year. The war still technically continues because it ended in 1953 with a cease-fire, not a peace treaty. An end-of-war declaration would be the first step toward an eventual formal peace treaty, but the United States is wary about signing off on something that could result in Kim pushing for the removal of U.S. troops stationed in South Korea to deter the North. However, their premier accord on the issue that most worries the world -- the North's pursuit of nuclear-tipped missiles -- contained a big condition: Kim stated that he would permanently dismantle North Korea's main nuclear facility only if the United States takes unspecified corresponding measures. "Chairman Kim Jong Un has again and again affirmed his commitment to denuclearization," Moon said after returning to Seoul. "He expressed his wish to finish a complete denuclearization as soon as possible and focus on economic development." Moon said North Korea's agreement to allow international experts to observe a "permanent" dismantling of a missile engine test site and launch pad was the same thing as a commitment to "verifiably and irreversibly" demolish those facilities. Moon says such steps, combined with North Korea's unilateral but unverified dismantling of a nuclear testing ground earlier this year, would prevent the North from advancing its weaponry through further nuclear and missile tests. Experts say the destruction of the missile engine test site and launch pad wouldn't represent a material step in the denuclearization of North Korea, which declared its nuclear force complete last year and has designed its most powerful missiles to be fired from vehicles. "I wish there would be an opportunity for my fellow citizens to see Chairman Kim Jong Un for themselves and hear him talking about the denuclearization of the Korean Peninsula, peace and prosperity with his own voice," the South Korean president said. 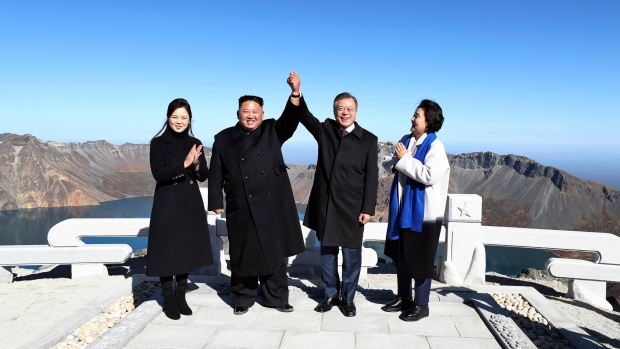 Earlier in the day, the leaders smiled broadly as they posed at the summit of Paektu, their wives grinning at their sides, a brilliant blue sky and the deep crater lake that tops the volcano in the background. They also toured the shores of the lake, where Moon and his wife filled bottles with its water and a South Korean pop singer delivered for the leaders a rendition of a beloved Korean folk song, "Arirang," which is used in both Koreas as an unofficial anthem for peace. The mountain is important to the Kim family, members of which are referred to as sharing the "Paektu bloodline," and the volcano is emblazoned on North Korea's national emblem and lends its name to everything from rockets to power stations. Many South Koreans also feel drawn to the volcano, which, according to Korean mythology, was the birthplace of Dangun, the founder of the first ancient Korean kingdom, and has long been considered one of the most beautiful places on the peninsula. Not everyone was pleased, though. About 100 anti-North Korea protesters rallied in central Seoul to express anger about the summit and displayed slogans that read, "No to SK-NK summit that benefits Kim Jong Un." But while containing several tantalizing offers, their joint statement appeared to fall short of the major steps many in Washington have been looking for -- such as a commitment by Kim to provide a list of North Korea's nuclear facilities, a solid step-by-step timeline for closing them down, or an agreement to allow international inspectors to assess progress or discover violations. It also was unclear what "corresponding steps" North Korea wants from the U.S. to dismantle its nuclear site. The question now is whether it will be enough for Trump to pick up where Moon has left off. Trump told reporters Wednesday that the outcome of the summit was "very good news" and that "we're making tremendous progress" with North Korea. He didn't indicate in his brief remarks whether the U.S. would be willing to take further steps to encourage North Korean action on denuclearization. According to a statement signed by the countries' defence chiefs, the two Koreas agreed to establish buffer zones along their land and sea borders to reduce military tensions and prevent accidental clashes. They also agreed to withdraw 11 guard posts from the Demilitarized Zone by December and to establish a no-fly zone above the military demarcation line that bisects the two Koreas that will apply to planes, helicopters and drones.